Grassellino’s work on nitrogen doping includes the discovery of the effect itself; making it into a simple, practical technology; transferring the know-how to other laboratories and industry; and finally successfully implementing it in an accelerator. This advance represents one of the largest breakthroughs in the field of radio-frequency superconductivity in the past 10-plus years. 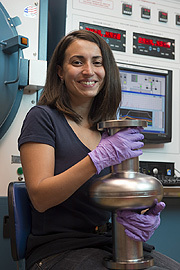 LCLS-II at SLAC National Accelerator Laboratory will be the first beneficiary of nitrogen doping, resulting in an overall potential cryogenic cost reduction by a factor of more than two compared to current state-of-the-art treatments, as described in the nitrogen doping discovery paper. The prestigious IEEE PAST Award goes to individuals who have made outstanding contributions to the development of particle accelerator science and technology. Previous PAST awards have gone to prominent accelerator scientists, including former Fermilab Chief Technology Officer Hasan Padamsee, current Chief Technology Officer Sergey Belomestnykh and Ilan Ben-Zvi of Brookhaven National Laboratory. The 2016 PAST Awards will be presented at the 2016 North America Particle Accelerator Conference, which will be held in Chicago in October.